My Community Directory has a long history of trying to deliver information in many formats so that it can be consumed by whoever needs it, in the manner that best suits them. 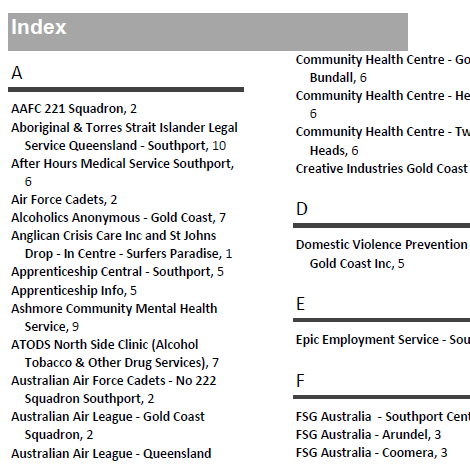 For some time one of the ways we have done this is with PDF directories which are regenerated nightly from the live data. These directories bridge the gap for those who like the feel and touch of paper or perhaps cannot access a computer readily. The plus side of this technique is fetching the latest directory from My Community Directory is easy, so there need not be long delays that have traditionally been required. The other advantage is the PDF version can be an awesome desktop resource – the data is all hyperlinked so phone numbers can be called directly (from a mobile at least), emails sent plus google map directions to services. We have been using the Syncfusion tools to produce these quite successfully but have hit a hurdle where some of our partners would like us to include an alphabetical index in the back of the directory. This is a great idea but is sadly not something Syncfusion is capable of. The solution is Aspose.Words which has come to the rescue. This is another library which allows us to produce high quality printed directories but in this case it can produce and index. Thankfully porting from Syncfusion to Aspose was relatively painless – they are both based fundamentally on how Microsoft Word works and so they offer the same core feature set in a very similar way. In total, it took about 4 hours to switch libraries which was much less than expected. So where to from here? We will continue to produce high quality resources for people in the ways that matter most to them. When we hit challenges we will always seek to overcome them because that is the part we play in improving our community. If you have more suggestions about how Community Information Support Services can help you – both with My Community Directory and our other websites and apps – just let us know. Today begin a new era, My Community Directory website will be administered by Community Information Support Services - This is good news with a reduction of membership fees and a new model for delivery. All contracts remain valid and will be provided by Community Information Support Services. The world can be a better place with shared data.